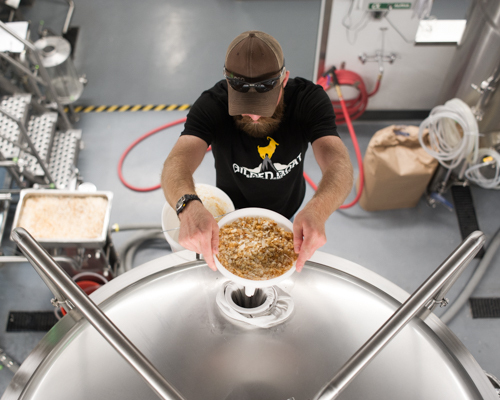 The Gilded Brewhouse — Gilded Goat Brewing Co.
Our brewmaster guides homebrewers through the science behind aging your beer, from the molecular evaluation of beers to to the patience and experimentation required of your favorite batch of "spiced chocolate apricot stout." Our beertender dives into the history of the Oktoberfest style of beer, and the storied tradition of a Bavarian beer festival that would eventually consume beer enthusiasts the world over. A glimpse of a brewhouse in action: from milling the malts, turning those malts into wort in the mash tun, boiling with hops in the kettle, and through the heat exchanger to the fermentation tanks. Q&A with Gilded Goat brewmaster Charlie Hoxmeier, who discusses his homebrewing career, health science and beer science and how they relate, and the importance of beer in the community. Our next feature will take you just north of Fort Collins to the Celastrina Hop Farm, where we visit Drew and Kiki and talk Colorado hop production, best practices, and farming with the local brewing industry in mind.